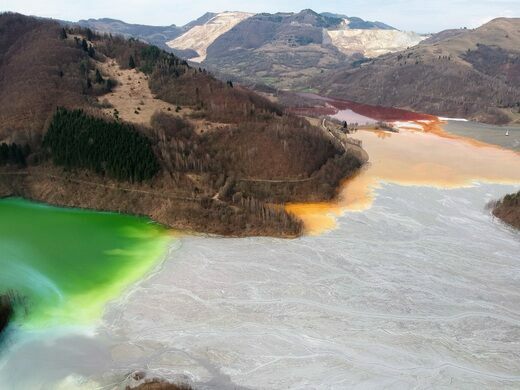 Once a bustling settlement nestled in a picturesque Romanian valley, the village of Geamana was wiped from the map to make room for a toxic dumping lake, yet traces of the stubborn little town still dot the landscape. Packed to the ceiling with antique taxidermy and hunting arms. A small town Romanian cemetery filled with darkly humorous gravestones. Religious structure known for its sculpted details. Up until the shockingly recent year of 1978, Geamana village was thriving with a markedly comfortable and happy populace living in a lush valley. Unfortunately it was this same year that rich reserves of copper were found in the nearby area, the mining of which created huge amounts of toxic waste that had to be disposed of. Seeing the Geamana valley as the perfect bowl in which to pour his newly cooked toxic soup, communist dictator and Romanian supervillain Nicolae Ceausescu ordered the village to be abandoned and flooded the entire valley. Once flooded with water, Ceausescu began dumping unfathomable amounts of sterile toxic elements into the new lake turning the waters into a multi-colored sludge, and erasing almost all memory of Geamana from the land save for a few rooftops and a lonely steeple breaching the morass. A majority of the citizens migrated to other villages nearby, but a few stubborn locals simply moved to the edges of the flood area where they continue to live today with no public infrastructure such as schools or doctors. The only access to the lake is by mud tracks, which may not be suitable to all cars. Take in towering gothic churches, stunning palaces and monasteries, and a former salt mine that's been turned into an underground wonderland. This 11th-century structure is one of the oldest churches in Romania. This bone-filled cave got its name after they found 140 bear skeletons inside. The beauty and the beast of hydraulic mining is on full display at this California Historic State Park. This former small town was destroyed not by the motor oil it sprayed the ground with but by the toxic waste that was added. Toxic waste disaster that founded the Superfund program.